If you are looking for a firm sleeping surface with the gentle touch of support foam, the Lillington Firm mattress made by Five Star Mattress might be right for you. Designed to offer incredible support to your back and body, the Lillington Firm is a great mattress for your kids, guest rooms, or even your own bedroom. Here are just a few of the features you will enjoy when you select this incredible mattress. The heart of the Lillington Firm is 391 PostureSmart® Innerspring coils, designed to absorb pressure and distribute force evenly. These coils are created to be exceptionally strong, protecting the life of your mattress. 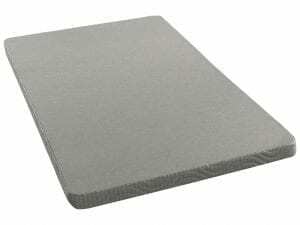 To make your sleeping surface a little softer, the Lillington Firm also contains a thick layer of HI IFD Support Foam. This foam provides an incredible amount of cushioning that promotes extra support. The supportive innersprings of the Lillington Firm are reinforced with a steel perimeter that helps to stabilize the entire edge of the mattress. This helps to prevent roll off and increase the usable sleeping surface of the mattress. Five Star Mattress believes in creating jobs and supporting the US economy, which is why all of their mattress sets are designed and build right here in the USA. The “Made In America” seal also means that investing in a Five Star Mattress can help you to protect your family. Since all 23 of Five Star’s factories are in the United States, they are regulated closely by government safety and emission standards, which helps to reduce pollution. Also, since Five Star manufacturing facilities are located throughout the country, it lowers shipping costs to retailers, saving you money. Do you know what the foams in your house are made of? To keep you and your family safe, Five Star Mattress only uses foams that are CertiPUR-US Certified. To become certified, these foams are free of potentially dangerous chemicals like TCEP flame retardants, ozone depleters, formaldehyde, phalates, and heavy metals like mercury. Five Star Mattress stands behind their products, which is why they offer a 1-Year Limited Warranty on all of their mattress sets. In addition to covering things like sagging and body impressions, this warranty also protects you from damage due to manufacturer’s defects. 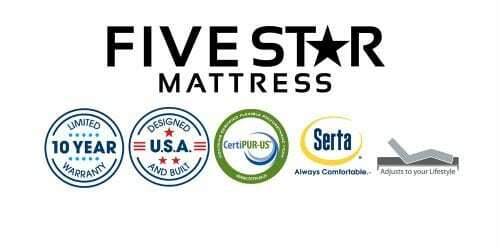 Best Mattress: Your Source for Five Star Products Best Mattress is dedicated to offering their customers with a wide variety of products, prices, and mattress accessories, which is why they are proud to carry Five Star Mattress products in all of their locations. Created with economics in mind, Five Star Mattresses offer the same quality as some of the other name-brand mattress sets without the steep price tag. If you are interested in exploring Five Star Mattresses, visit a Best Mattress near you.